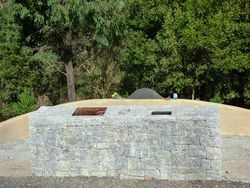 A monument commemorates the impact of the 2009 bushfire on the community and contains a memorial plaque dedicated to the 12 people from the area who perished in the fires. On February 7, 2009 devastating bushfires raged across Victoria. 173 people died. This memorial is dedicated to the memory of twelve local people who lived and died in the area of Coombs, Humevale and Yea Roads. The impact of the bushfires changed the environment and our community forever. Over 2000 homes were destroyed or damaged, and extensive damage occurred to infrastructure and community facilities. 430,000 hectares of bush and productive farmland were burnt. The regeneration of the natural environment is visible and inspiring to those who continue on their life journey. The generosity and goodwill demonstrated by the broader community in the days, weeks, months and years after the fires was overwhelming and greatly appreciated by those impacted. 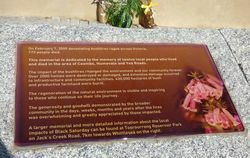 A larger memorial and more detailed information about the local impacts of Blacks Saturday can be found at Toorourrong Reservior Park on Jack's Creek Road, 7km towards Whittlesea on the right. So too are we bonded with our families now passed away. Their existence laminates every part of our being. How wonderful it is to still have you here within us.